State Parks has consulted with the land/resource managers in the state to provide information about designated riding areas. All the listed areas have received funding from the Statewide OHV Program to develop trails and facilities. The listed sites do not represent all of the available opportunities in Arizona. Where ever you choose to recreate, be sure the roads, trails or areas are designated for your type of use. What does “designated” mean? 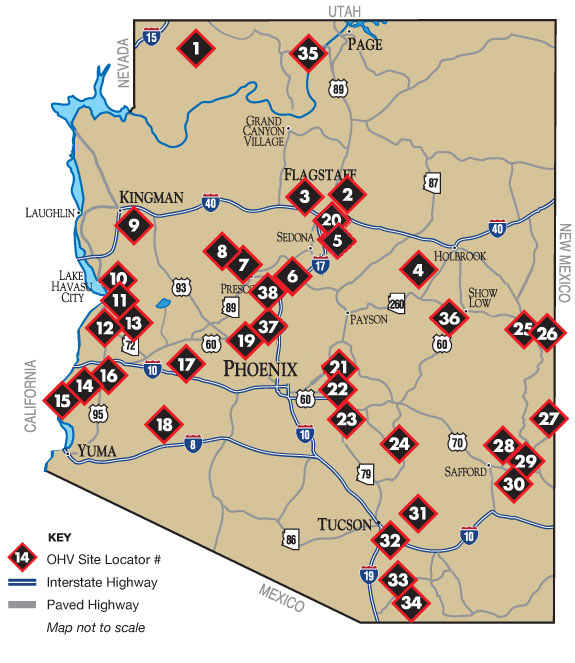 The federal land managers in Arizona (Forest Service and Bureau of Land Management*) have established criteria that identifies roads, trails and (open) areas that can be used for OHV recreation. Designated roads, trails, or areas will be marked with a route/trail number and appear on a map available from the land managers travel on other than designated routes, trails, or areas is illegal and fines may be assessed. Riding off of designated roads, trails, or areas can cause the designated roads, trails, and areas to be closed. *National Park service does not generally provide or support the use of unlicensed OHV’s within their parks. The Arizona Strip, “where the west stays wild,” is that vast region of Arizona north of the Colorado River. Much of this remote and largely unsettled area is traversed by more than 5,000 miles of dirt roads. Road conditions range from well-maintained graded roads to high-clearance two-tracks to challenging routes which require 4-wheel drive vehicles. No services are available in this largely backcountry area, so be prepared. Motorized vehicles are generally limited to existing routes, with wilderness areas closed and National Monuments limited to designated routes. Watch for signs in these areas, with terrain which ranges from High Desert to Ponderosa Pine Forest. While this area is generally suitable for all seasons, you should avoid use in wet weather. Contact the Bureau of Land Management, Arizona Strip Field Office at (435) 688-3200. More information about the Arizona Strip and eastern map. This area comprises an extensive stretch of deep volcanic cinders in a Ponderosa pine forest, east of Highway 89 and south of Sunset Crater National Monument. You are asked to protect the privilege of riding in this designated off-highway vehicle area by respecting the boundary of Sunset Crater National Monument. Approximately 13,500 acres are available for all types of motorized vehicles. This area encompasses Ponderosa pine forest and is open all seasons, with occasional snow in winter. To get to the Cinder Hills OHV Area, drive northeast of Flagstaff on U.S. 89 approximately seven miles north of Flagstaff Mall. Turn east (right) on FR 776. Contact Coconino National Forest, Peaks Ranger District at (928) 526-0866. More information and a map. Riding areas are available for snowmobiles on signed trails, when conditions permit. This area is comprised of Ponderosa pine forest. Contact Coconino National Forest, Peaks Ranger District at (928) 526-0866. This 30-mile loop for highway-legal/licensed vehicles is located on the Mogollon Rim northeast of Payson. Start at either Long Draw North Trailhead (Chevelon Crossing) or Long Draw South Trailhead (Chevelon Lake). Trailhead includes parking, toilets and campsite facilities. The area has shared use routes open for off-highway vehicle use, including snowmobile trails and is comprised of Ponderosa pine forest. This area is generally open all seasons, but routes may be closed due to winter snow. Contact Apache-Sitgreaves National Forest, Black Mesa Ranger District at (928) 535-4481. The Munds Park OHV trail system links the community and visitors to a network of Forest Service system roads in the area, with three-season riding in the cool pines. Routes may be closed in winter due to snow or other weather conditions. Contact Coconino National Forest, Peaks Ranger District at (928) 526-0866. Located just five miles south of Lake Havasu City, the area offers more than 7,500 acres providing fun, challenging trails for many types of OHV opportunities and camping. You must use existing routes only. This area is comprised of Low Desert and includes spring, fall and winter seasons. Contact Bureau of Land Management, Lake Havasu Field Office at (928) 505-1200. This desert racing event has been around since 1972. Although the course has changed over the years, it still offers three loops of about 136 miles. The race is usually on a weekend in late January or early February. The course offers a demanding, difficult route all year long. Parts of the course require vehicles to be highway-legal/licensed. Access is available near Parker, Arizona in La Paz County. This area is Low Desert and includes the spring, fall and winter seasons. Contact Bureau of Land Management, Lake Havasu Field Office at (928) 505-1200. Located east of Parker using Shea Road, much of the area is defined by post and cable, which are the boundaries of a race vehicle pit and spectator areas of the Parker 400 Desert Race. The braided Osborn Wash is adjacent and to the south of the Spectator Area. These locations combine to create excellent OHV riding and camping opportunities. This area is Low Desert and includes the spring, fall and winter seasons. Contact the Bureau of Land Management, Lake Havasu Field Office at (928) 505-1200. Located 30 miles east of Parker, this Low Desert area allows all types of OHVs and passenger cars and includes interpretation, picnic areas, facilities and camping. You can tour an historic mining town. Contact the Bureau of Land Management, Lake Havasu Field Office at (928) 505-1200. This area is located between the City of Ehrenberg, the City of Cibola, the Colorado River and the Yuma Proving Ground. Vehicle travel is limited to existing routes and is prohibited in the Trigo Mountain Wilderness. Visitors are asked to obey all warning signs and to call the Yuma Proving Ground at (928) 328-2720 for access information. The Cibola National Wildlife Refuge is at the south part of the area. Please obey signs and call the Refuge at (928) 857-3253 for information. This area is Low Desert and includes the spring, fall and winter seasons. For maps and information contact the Bureau of Land Management, Yuma Field Office at (928) 317-3200 or via e-mail at yfoweb_az(at)blm.gov. This area is located near Quartzsite, Arizona at the intersection of Highway 95 and Interstate 10. It is bordered on the southwest by the Yuma Proving Ground – (928) 328-2720 – and on the southeast by the Kofa National Wildlife Refuge & Wilderness – (928) 783-7861. Call for access information. Vehicle travel is limited to existing routes and is prohibited in wilderness areas. Please obey all warning signs. This area is Low Desert and includes the spring, fall and winter seasons. Contact the Bureau of Land Management, Yuma Field Office at (928) 317-3200 or via e-mail at yfoweb_az(at)blm.gov. This is a rugged 3,000-foot and 10.5 mile climb to historic 1920 Smithsonian Solar Observatory. The site includes picnic areas, restrooms, access to historic hiking trail and primitive camping. Vehicle travel is allowed only on existing routes. This area is Sonoran Desert and is hot in the summer with thunderstorms and washouts on road. Contact the Bureau of Land Management, Hassayampa Field Office at (623) 580-5500. This area is located in Yuma and Maricopa Counties between Interstates 10 and 8, with the Yuma Proving Ground (928-328-2720) and Kofa National Wildlife Refuge (928-783-7861) to the west. Please call for access information. The area encompasses a large portion of the Arizona Game and Fish Department's Hunting Unit 41. Vehicle travel is limited to existing routes. There is no vehicle travel in Wilderness Areas. Please obey all warning signs. This area is Low Desert and includes the spring, fall and winter seasons. Contact the Bureau of Land Management, Yuma Field Office at (928) 317-3200 or via e-mail at yfoweb_az(at)blm.gov. Numerous OHV routes traverse this area, which is bounded by Lake Pleasant to the east, Wickenburg to the west and Prescott National Forest on the north. Vehicle travel is allowed only on existing routes. The Boulders Staging Area, off Highway 74 between mileposts 11 and 12, offers access, camping and restroom. This area is a mix of private, state and public land and you are asked to comply with signs, carry a map and to not trespass. Please ride SLOWLY in the staging area to reduce dust and for safety. Excess dust can lead to closure, so please follow rules to help keep this site open. This area is Low Desert and includes the spring, fall and winter seasons. An Access Guide for this area is available from the Bureau of Land Management (BLM). Contact BLM, Hassayampa Field Office, (623) 580-5500. This site is subject to closure on days when a high pollution advisory for dust (known as PM10) has been issued. Before heading out, please check to see if an advisory for PM10 has been issued, at https://azdeq.gov/forecasting. Area is located one hour from Phoenix, east of the Beeline Highway, north of Saguaro Lake, and south of Four Peaks Road. Vehicle travel is allowed only on existing routes. This area is Low Desert and includes the spring, fall and winter seasons. Contact Tonto National Forest, Mesa Ranger District at (480) 610-3300. This site is subject to closure on days when a high pollution advisory for dust (known as PM10) has been issued. Before heading out, please check to see if an advisory for PM10 has been issued at https://azdeq.gov/forecasting. Located one hour from Phoenix, with access from the City of Mesa at Usery Pass Road, off of the Bush Highway. Vehicle travel is allowed only on routes designated as open by brown fiberglass vertical markers. All routes other than FR10, 12, 1356, 3512, 3556 and 3554 are closed to motorized travel. Use of Bulldog OHV area requires a permit. This area is Low Desert and includes all seasons Get online directions to Bulldog area access locations Contact Tonto National Forest, Mesa Ranger District for a required permit at (480) 610-3300. This site is subject to closure on days when a high pollution advisory for dust (known as PM10) has been issued. Before heading out, please check to see if an advisory for PM10 has been issued at azdeq.gov/ensemble.pdf . This site is available for recreational use, thanks to the collaborative efforts of volunteers and land management agencies. This area includes more than 180 miles of trails located one hour east of Phoenix, near Apache Junction (U.S. Route 60 and State Route 79). This site requires an Arizona State Land Department (ASLD) recreation permit to ride. Vehicle travel is allowed only on existing signed routes. There are grazing allotments for four different cattle ranches within this area. Please stay out of cattle water tanks (which look like dirt mounds) and respect the closed gates and grazing areas. There are NO hillclimbs in this area. The area is relatively flat with some rolling trails. Excess dust can lead to closure, so please follow rules to help keep this site open. Do not ride near the fence along the road. Help pick up trash. There is no target shooting. This area is Low Desert and includes the spring, fall and winter seasons. Contact ASLD at (602) 364-2753 to purchase a permit or learn about permits online. Contact AZ Game and Fish Department for an access guide at (602) 942-3000 or download online guide at Arizona Game & Fish Department website. This site is subject to closure on days when a high pollution advisory for dust (known as PM10) has been issued. Before heading out, please check to see if an advisory for PM10 has been issued at https://azdeq.gov/forecasting. This area near Kearny is good for beginners and allows for all types of off-highway vehicles. The elevation ranges from 2000 to 2400 feet. Use is limited to existing routes which are located on land managed by the Bureau of Land Management. This site includes a staging area, picnic and camping areas and restrooms. This area is Low Desert. Contact the Town of Kearny at (520) 363-5547.This site is subject to closure on days when a high pollution advisory for dust (known as PM10) has been issued. Before heading out, please check to see if an advisory for PM10 has been issued at https://azdeq.gov/forecasting. When snow closes roads in the National Forests, this route remains open for snowmobile use. Facilities include toilets, and trailhead parking accommodates trailers. The route traverses beautiful mountains and meadows through forests of pine, spruce, and fir. Contact the Apache-Sitgreaves National Forest, Springerville Ranger District at (928) 333-4372. Saffel Canyon Trail, near Eagar, includes some of the most spectacular views in the White Mountains. The trail begins at an elevation of 7600 feet and climbs to 9400 feet at Pat Knoll. The distance is 25 miles, round-trip and the difficulty level is moderate. The trail goes through three distinct vegetation zones: pinyon-juniper, Ponderosa pine and mixed conifer. There is trailhead parking which accommodates trailers; the trailhead has two picnic ramadas, restroom, and a "tot lot" where young riders can learn some basic ATV skills. Trail access is near Eagar. Contact the Apache-Sitgreaves National Forest, Springerville Ranger District at (928) 333-4372. Map is available. Located 20 miles northeast of Safford, this site offers rugged OHV opportunities. Motorized vehicles are restricted to designated roads. The Gila River corridor is closed to all motorized vehicles within the Gila Box Riparian National Conservation Area (RNCA). This area is High Desert with spring, fall and winter seasons. Contact the Bureau of Land Management, Safford Field Office at (928) 348-4400. The old Safford-Clifton Highway takes you back in time and offers challenging 4x4 side trips. The south entrance is 16 miles east of Safford. This area is High Desert with spring, fall and winter seasons. Contact the Bureau of Land Management, Safford Field Office at (928) 348-4400. This 2,000-acre “open” dune area is located 35 miles south of Safford. Facilities include two hot tubs, restrooms, developed and undeveloped campsites, picnic areas and a watchable wildlife area. Off-Highway Vehicles are also allowed on existing routes outside the Hot Well Dunes Recreation Area. This area is High Desert with spring, fall and winter seasons. Contact the Bureau of Land Management, Safford Field Office at (928) 348-4400. Located approximately 12 miles northeast of the City of Tucson and 24 miles south of San Manuel, Redington Road is the only access into this OHV recreation and natural resource area. Motorized travel is permitted only on designated routes. The secondary dirt roads found in this touring area are very rugged, and will challenge your technical driving skills. A high ground clearance 4X4 vehicle is strongly recommended. ATV and dirt bike riders find this area just as technically challenging. This is a High Desert and oak woodland area. More information and a map. For an area brochure contact the Coronado National Forest, Santa Catalina Ranger District at (520) 749-8700. Located south of Tucson, this county-operated park includes competitive and practice/beginner motorcross tracks which only allow bikes. Other riding areas include an ATV track, cross-country trail and OHV obstacle course. This area offers ATV certification classes and is Low Desert. Park is for day use only and requires a fee. Contact the Pima County Parks and Recreation Department at (520) 877-6000. Just west of Highway 83 and north of Sonoita, the east side of the Santa Rita Mountains offers miles of roads in High Desert and oak woodland foothills. This area is subject to all seasons, and must avoid wet conditions. More information and a map. Contact the Coronado National Forest, Nogales Ranger District at (520) 281-2296. Between Nogales and Sierra Vista and east of Highway 82, the Patagonia Mountain range offers many opportunities for OHV recreation. This area includes High Desert scrub and oak woodland. This area is subject to all seasons, and you are should avoid wet conditions. Contact the Coronado National Forest, Sierra Vista Ranger District at (520) 378-0311. More information. The Great Western Trail (GWT) is a long and primitive shared-use route anticipated to run from Mexico to Canada through Arizona, Utah, Idaho, and Montana. The GWT is north of Phoenix and traverses rugged and beautiful country in the Tonto, Prescott and Kaibab National Forests, as well as BLM lands on the Arizona Strip. Some segments require vehicles to be highway-licensed/legal. The Copper Canyon Trailhead Project is a multi-use trailhead located just outside of Camp Verde on the Prescott National Forest. The trailhead is located on Forest Road 136 and provides a connection to the Hayfield Draw OHV Area located about 10 miles away (on Highway 260) via Trail 545. FR136 provides a connection to the Great Western Trail and a scenic ride to the top of Cherry Peak.